I get lots of questions on how to clean a kitty litter box and how to keep it smelling fresh. Here are my tips. Use a clumping kitty litter. I've been using World's Best Cat Litter for years. It's made from corn and doesn't contain any fragrance or scent. I try to stay on top of smells by scooping out poop and clumps at least once a day. The nice thing about World's Best is you can flush solids down the toilet. I once had a total of six cats and kittens and my apartment didn't smell at all. (They have a multiple cat formula too.) I swear by World's Best, but there are other natural clumping brands out there, including Beth Anne's Finest. Cover the bottom of a kitty litter box with an entire small box of baking soda. Cover that with a layer of kitty litter about three inches deep. This should keep things pHresher and extend the amount of time in between full litter box cleanings. When we moved we had a kitty litter emergency and had to buy a bag of the clay kind from the corner store. This helped keep things from getting too funky. 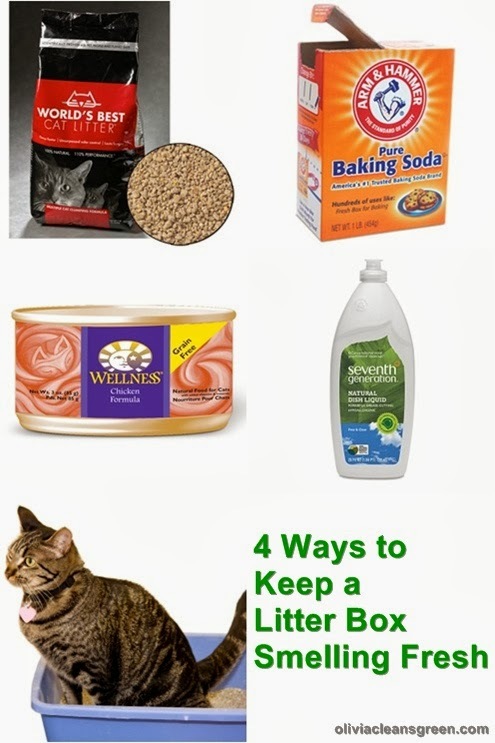 You can also keep an open box of baking soda near the litter box to help absorb odors. Feed your cat good food. This is kind of obvious, but yeah, you need to dump all the litter out and wash the box occasionally. Exactly how often depends on what kind of litter you use and how many cats share the box. Every other week works for one and two cat families. 1. Dump everything. // 2. Rinse and dump water into toilet. // 3. Put 1/2 cup baking soda to the box. Fill with warm water. Add a few drops of fragrance-free dish detergent. (I like Seventh Generation.) // 4. Soak for 15 minutes. // 5. Scrub // 6. Empty and rinse. // 7. Dry and add litter.